The fall season for the men’s and women’s tennis teams is notoriously short, but heated with huge tournaments packed into the two-month stretch. 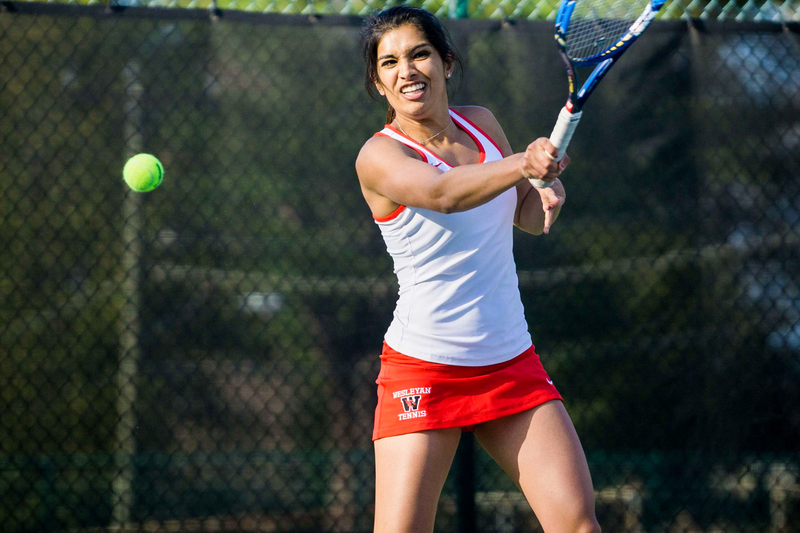 Both teams will participate in Intercollegiate Tennis Association (ITA) tournaments. At the USTA/ITA New England Regional Championships later this month, the Cards will match up against familiar NESCAC foes. If Wes players qualify, they will then compete in the ITA National Small College Championships a few weeks later. With only about three weeks to prepare, the women’s team will send their top players off to the ITA’s at MIT on Sept. 23. Last year, the Cards made quite the statement at ITAs, with current captain Eudice Chong ’18 and Victoria Yu ’19 sweeping the doubles bracket and upsetting the top three seeds for the title. Chong only dropped one set in the entire singles bracket to secure the New England Regional ITA Tournament singles title on top of the doubles crown and 11-0 record. She topped her own doubles partner, Yu, in the singles final. Dasha Dubinsky ’18, Helen Klass-Warch ’18, and Nicole McCann ’18 all competed in the singles bracket as well, with Klass-Warch and Dubinsky pairing up for the doubles competition. With the fall season just underway, the lineup for this year’s ITA tournament is in the works. After being named to the ITA Collegiate All-Star Team for the second time with back-to-back 2015 and 2016 NCAA Division III singles titles, it is likely that Chong will return to ITAs this season to defend her spot at the top. With Chong’s all-star doubles partner Aashli Budhiraja ’18 abroad, the team has a lot of puzzle pieces to put together before the tournament. Returning players Klass-Warch, McCann, Yu, captain Ella Lindholm-Uzzi ’17, and a single freshman recruit complete the roster for the Cards this fall. Despite the small numbers, Lindholm-Uzzi is more than ready for a hard-working season. The men’s team is ready to match the women’s grit going into ITAs this fall led by captains Mike Liu ’17 and Cam Daniels ’18. Last year at ITAs, Steven Chen ’18 tore his way through the singles bracket before falling to Noah Farrell of Middlebury in the semifinals. Chen was accompanied by teammates Liu, Jake Roberts ’17, Dhruv Yadav ’18, and Joachim Samson ’19 in the singles bracket. Chen and graduated Zacko Brint teamed up for doubles and went 1-1 while Yadav and Win Smith ’18 went 0-1. Similarly to the women’s team, the guys have much roster uncertainty to start out the fall season. The men’s team will have about three weeks to decide which singles players and doubles teams they will send to this year’s ITA tournament at Williams starting on Sept. 30. With last year’s seniors Brint, Michael King, and Sam Rudovsky now graduated, the Cards will welcome two new freshman recruits as well as the return of Smith. As of June 2 at the end of last season, the men’s team held a solid No. 10 national ranking while the women’s team stood out at No. 8. The men were outranked by No. 1 Bowdoin and No. 3 Middlebury, but confidently beat out the rest of the NESCAC teams. The women were outranked by No. 2 Williams, No. 3 Middlebury, No. 4 Bowdoin, and No. 7 Amherst. As expected, NESCAC teams dominate the top-10 national rankings and will make for grueling matchups come ITAs later this month. However, the Cards are already grinding away on the courts and are more than ready to control the brackets.